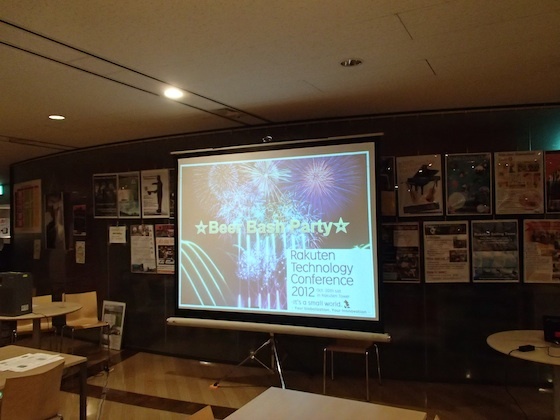 We have done Rakuten Technology Conference 2012 successfully! 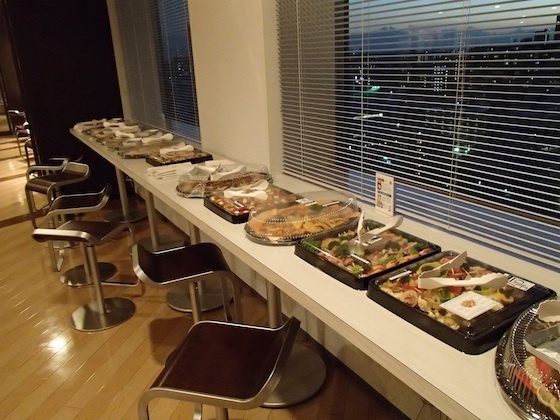 Thank you for coming! As a result, weather was fine, and participants were over 800 people in spite of all session held in English. The number of participants are the best ever and it was twice of last year. If you couldn’t participate, please check twitter. And Ustream is coming soon after the approval of publishing. You can find with key word “Rakuten Technology“. I will report about the operation and the retrospective as a conference committee member on that day. 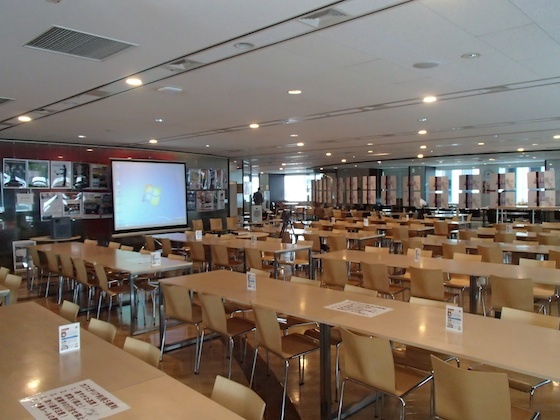 I operated the conference on the 13F Cafeteria. So I will mainly report the session and Beer Bash on 13F. About 8 a.m. at 4F before hole briefing session. Everyone is relaxing. After the construction on 13F. The calm before the storm. This picture is the sight before the first presentation by Kenji Hiranabe. People are gathering little by little. I have felt he is an expert of presentation. This picture is the session by Jeff Patton. It was overcrowded. 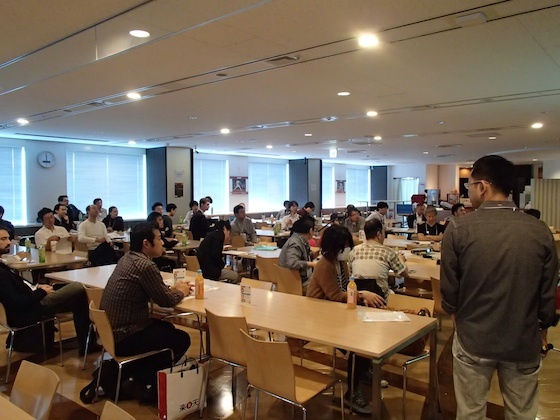 I guess there were people who concerned about Agile and who wanted to listen about overseas system development. 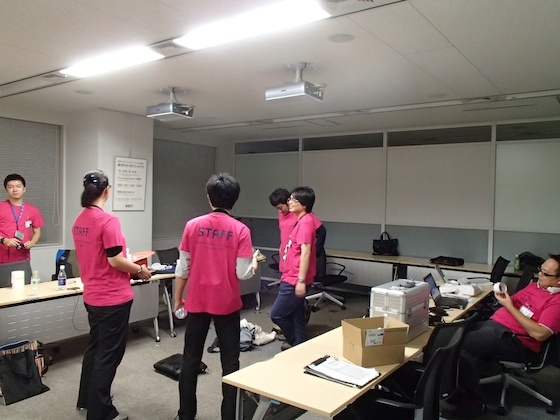 He checked the setting of presentation very well as Mr.Hiranabe. This picture is the session by Rumiko Seya. My impression of her was strong person because she work at dangerous job called Disarmament. 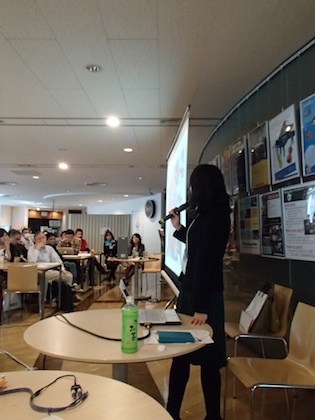 In former part, she presented about her work written in “My job is disarmament“. In latter part, she presented IT related issues like database of soldiers and shortage of IT professional in the industry. 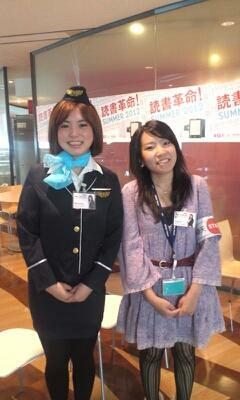 I had a chance to talk with her. So I will report about it afterward. This picture is the session by Masa Nakamura. Audience laughed the best at this presentation among 13F session. He showed some American-joke, so mainly got laughing by from oversea’s guys. I met Mr.Nakamura at agile2012. So it was 2 months after it. He is also open-hearted. 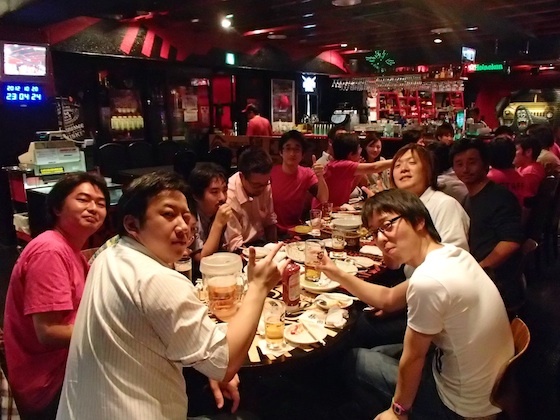 Agile guys are the common point that they are open-hearted and frank. Moderator Moricky & Sachi on 13F. They empowered the sessions. They practiced their script well before conference. Checking presentation of lightning talk competition at Beer Bash. 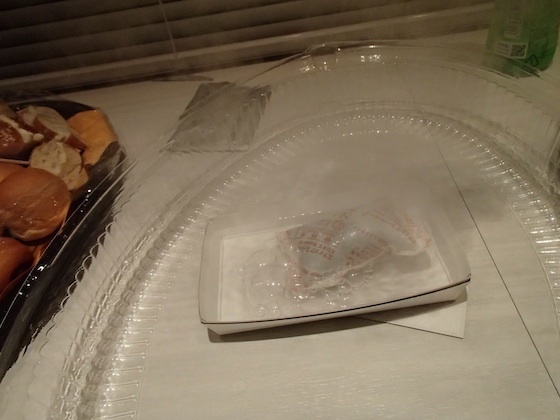 We put dishes along the window. The shutter was opened so that night sight would amuse guest eyes. Support team is decorating the beer. We could stick to detail because the construction finished speedy. 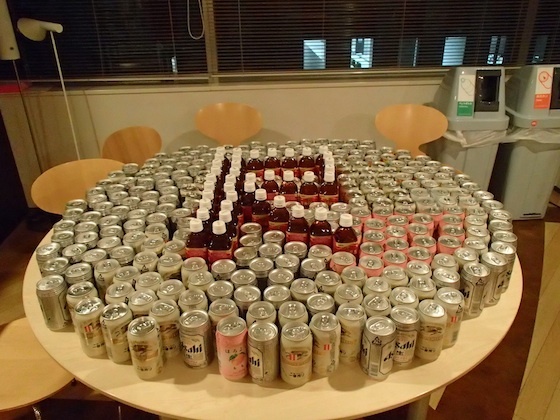 This is drinks put in front of the entrance. We made “R” logo. The sense of humor is the good point of our company. This is the way to make dish hot. After putting water on a material like heat pad, hot steam comes out. A material like heat pad spitting out hot steam. This is just after opening Beer Bash. Many customers are coming soon. 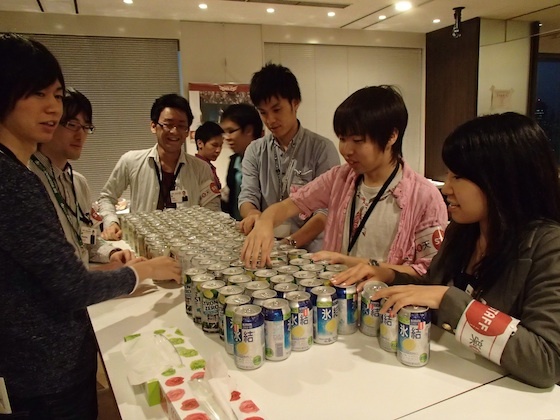 A presentation during Beer Bash. There are many people up to the back of the venue. Committee room on 3F. Smiling after getting it done. At the entrance of guest room on 3F. Last year we took a picture at the same place. Drinking with committee members. This table had rugged guys. I had a chance to talk with Rumiko Seya waiting for Beer Bash with Ms.Takahashi and Mr.Kawaguchi who are senior in my company. We had discussion deeply in brief time. From right side, Ms.Seya, Mr.Kawaguchi, Ms.Takahashi. Ms.Seya: I understand my favorite thing deeply. I check ‘SOY’（Shop Of the Year：An event to elect the best shop of the year）. Ms.Takahashi: It is surprising hearing the word ‘SOY‘ from a person out of company! Ms.Seya: We are under considering how to manage the organization of Disarmament. We can study from Agile development methodology. 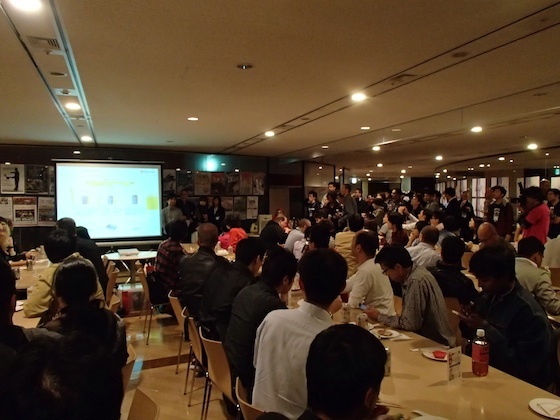 Mr.Kawaguchi: In Rakuten, we are enhancing Agile. There are still a few people who can lead Agile development. Ms.Seya: Now one of my friend works on an educational organization in United Kingdom. She(or He) is trying to involve education that can be practiced in the real society with industry-university cooperation. In Japanese university, there are few successful cases of it. Ms.Takahashi: I hope She(or He) can develop the first case. I want to sell contents of Agile education made by our company. If we can make a profitable model, the education will expand. Ms.Takahashi: You should say DDR. Ms.Seya: Speaking of DDR, ‘Dance Dance Revolution’ is interesting, isn’t it? I like games so so. In Rakuten, is there any games? Ms.Takahashi: Now we have no games but had formerly. ‘Lucky Lot’ is some kinds of game we are providing. 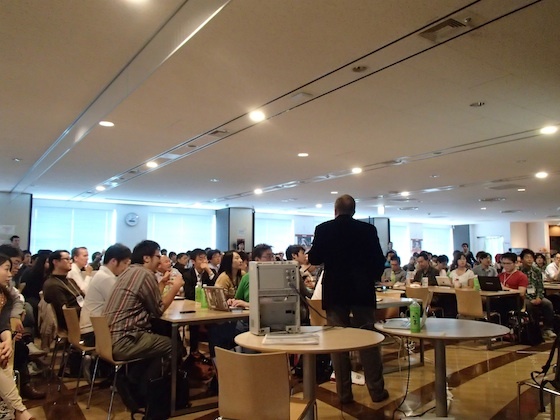 Mr.Kawaguchi: Gamification like ‘Point’ and ‘Rank’ will be continuously provided for the future. I: Are there any danger during your work? Ms.Seya: There are some people who said ‘I am lucky. So I don’t meet any danger’. But I have no optimism about my work. I research the risk much and consider how I can achieve my goal with the smallest risk. You can read about her work on this web sight. This is retrospective of Conference Committee. It depends on talk after the conference and during drinking. 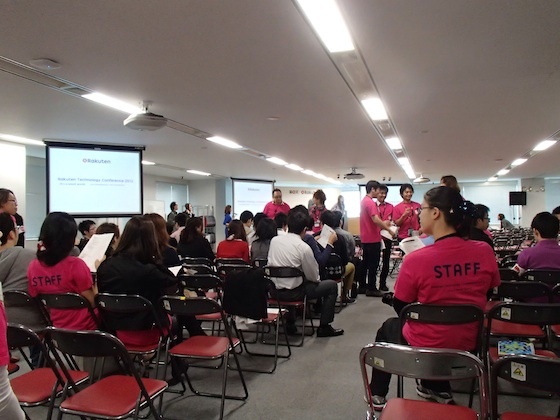 We could attract many people in spite of all English session. CNS (Acoustic contractor) was also surprised. This is the evidence of high curiosity on Englishnization. I guess there were many people under learning English. 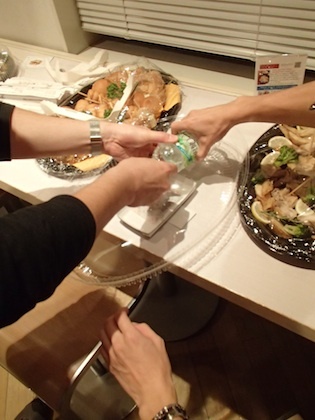 About Ustream : Last year, the equipment was weak and we had to switch the presentation and presenter by hand. This year, we had useful equipment and could switch by software. About construction : On 13F we should not move tables. On 5F one room should be a shed to put materials for conference. These method worked fine and we could shorten time of construction. 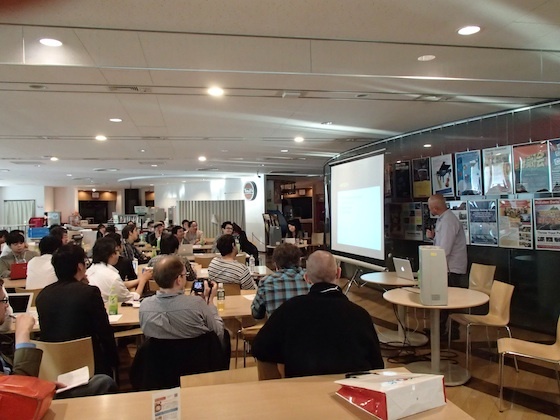 Mr.Hiranabe’s session was designed to hold 3 or 4 days before conference. Mr.Terie’s session was canceled the day before conference. Thank you for reading long text! Rakuten Technology Conference 2013 next year will be great one taking advantage of these retrospectives. Do not miss it!